Samsung profit forecast back on track | What Hi-Fi? Despite a recent political corruption scandal and the saga over exploding Note 7s, the South Korean giant is on track to deliver its best quarterly performance for four years. Samsung is forecasting that it will deliver record profits in the first quarter of 2017, with a rise of 48 per cent to $8.8bn (£7bn) in the period January-March. 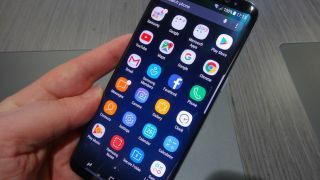 The company has been beset by a number of high profile problems, not least the withdrawal last year of its Note 7 phone due to exploding batteries. It is hoping that its recently revealed Galaxy S8 smartphone, due to go on sale later this month, will restore its battered reputation. Strong memory chip sales have also contributed to its improved financial performance, with the firm's share price picking up in the last few months. Samsung's success is vital to the South Korean economy, as the consumer electronics giant contributes a fifth of the country's GDP (Gross Domestic Product).